Try to imagine, that you discover a new beach in your own town !! A city that you have known for better and worse for aprox. 35 years. You would think, that you know the most – at least the beaches around the city? Now I personally do not trot around in Antalya for 35 years – only 17 years, but my husband has been living down here for long periods. Almost half of his childhood and most of his teenage years, so I would think, that he had a fairly good perspective on the beaches at least (if nothing else, then because he often truant from school and spent the days away with friends, on the beach or the boat). But the incredible thing happened during our recent holiday – I found a beach – even close to the city – which he didn’t know !!! Sarisu beach. Weee … ..
Allright, maybe I’m exaggerating just a bit. He knew about the beach, but had just never been there before. And the simple reason was, that the beach – until 2014, has been closed to the public and could only be used by certain groups of public employees, such as teachers and the police. He was therefore somewhat amazed, when I on one of our many driving tours, spotted a large sign towards this particular beach. Sarisu Plaji it’s called, this remote part of the great Konyaalti beach. 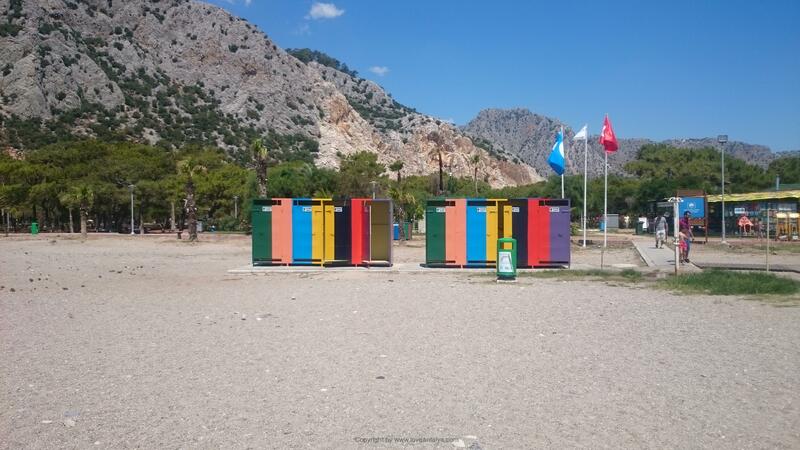 It is located past the big industrial harbor and closer to the irresistible mountains – in the absolute tip of the city, on the road to Kemer (turning of the road absolutely right before going up in the mountains). 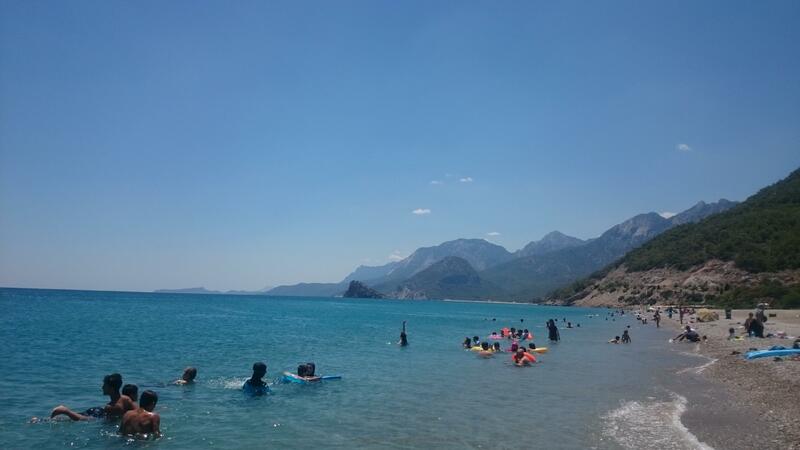 At the ultimate end, before the mountains, however, there is another small beach, which to some extent is still closed and is highly controversial and has generated much debate and division in Turkey. It’s called Kadinlar Plaji and is only for women (not a word about politics, AKP and President Erdogan’s Islamist leanings). Obviously it is a kind of limited for a family vacation. For all these reasons, we went happy off to Sarisu beach and was pleasantly surprised. It is a beach, that is as welcoming and good, as the beaches further towards the city. But this part of the beach is much more local and popular and … well, cozy in my opinion (allthough I also saw quite a few people who looked a little too much to my side. But hey – there isn’t that many tourists at this very local beach . But I could also be, that there were many people from the inland because of the Ramadan, so fair enough if they perhaps wondered a little). 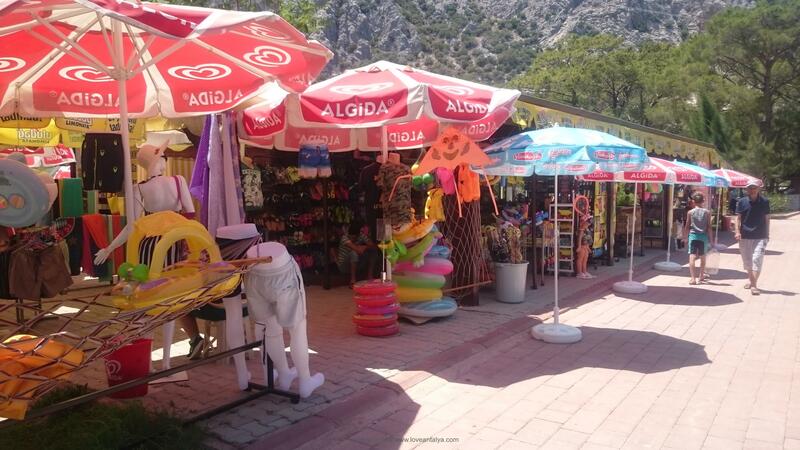 On the way down towards the beach you cross a larger area with established barbeques, tables and benches, hammocks, small shops where you can buy everything for a beach and picnic-life (incl. Fuel and meat !!). 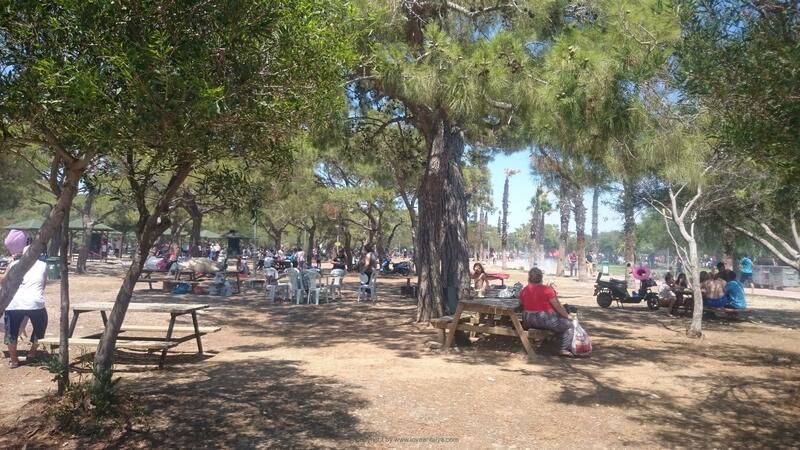 Typically Turkish seizing every chance to go for a picnic – it is almost a kind of national sport (but who can blame them, when 98% of the people in Antalya lives in apartments with no garden). We went to the beach in one of the last days of Ramadan, so there were a lot of people, because everybody had some days off. But it was without too much noise and all seemed to fit her and enjoy themselves tremendously, so it was still very relaxing. In the small park, there were also a few small cafes, where you could sit in the garden and enjoy a little refreshment – we didn’t tried them because we were just off to a quick visit at the beach. But they looked fine and certainly usable. The beach was long and wide and slightly stoned, as we know it from Konyaalti and the seashore turns deep quickly, like the rest of the beach line, but it was all in all quite family friendly. Fortunately, there was also the chance to take a cold bath in fresh water, so you could wash some of the Mediterranean salt off. Toilet and changing facilities were also there. 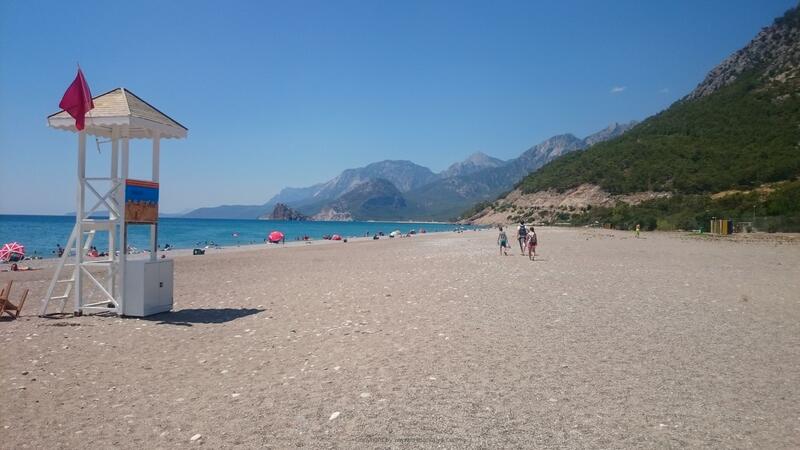 There were only a few places with umbrellas and sunbeds (but there were too many people in those places), so we went further down the beach, where there was a little more deserted and we could be ourselves. The consequence was to sit on your towels instead – but it was allright. At the beginning of the beach (at the places with the sun chairs) it was a little more beach park-like with several activities such as volleyball, boat rental etc., So there is a little to do (but without the high music, as we know it from the more touristic places further towards the city). I have always thought, that there is something absolutely fascinating with mountains and with small islands. In this part of the beach you are as close to both, as you can get = a pretty incredible sight. I my eyes, it’s a bit exotic – maybe because there isn’t any mountains (at all) and lush islands close to the beach in Denmark. Had we known that there were that fine picnic areas in the park, we had perhaps combined both barbecue, picnic and beach swimming. 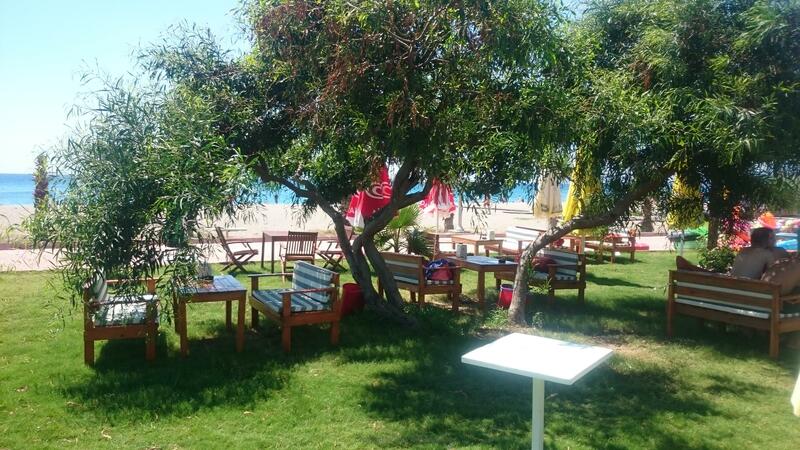 There is just something extremely cozy abaout picnic in Turkey – delicious food and beautiful surroundings. And then just a walk down to the beach – it’s irresistible. If you have any spare time or the smallest opportunity, consider at least to go here. Just to try something that is a bit different and not mainstream touristy. « Liebster award – hvem mig? ?